Family and friends often ask me how Western holidays are celebrated in China. Christmas decorations are very popular here now, particularly in luxury malls, and young couples have embraced Valentine’s Day wholeheartedly. But Halloween hasn’t really caught on yet. One of the things that surprised me when I was in Hong Kong was seeing how many stores and markets had costumes and special bags of fun-sized Halloween candy for sale—those are both still uncommon on the mainland. I didn’t see many children in costume yesterday, and those that I did spot were all clearly foreigners. 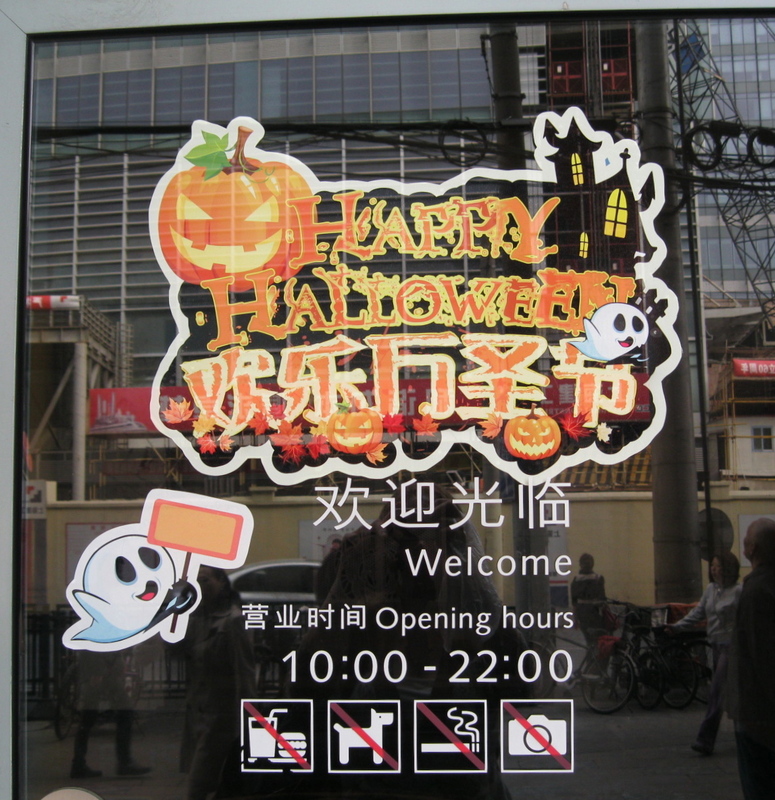 I’m sure that the high-end housing compounds where some expats live organized trick-or-treating for the kids in the community, but overall, Halloween isn’t much of an event in Shanghai—yet. I did notice many more Halloween decorations this year. These were still mostly limited to malls and Western bars/restaurants, but definitely more prevalent than I recall in the past. At least one of the big shopping malls on Huaihai Road was also advertising a massive “Halloween Sale.” Things move so fast in China that I wouldn’t be surprised to see full-scale Halloween celebrations taking place within the next few years. “After spending 1.5 hours on the pumpkin, I was exhausted and just painted some color on it,” [one mother] said, adding that although the kindergarten asked parents to make a lantern with their children, her 3-year-old could do little to help. But I would bet that even in the face of unenthusiastic parents, a holiday that involves dressing up in costume and receiving candy will be quick to catch on among Chinese children. Maybe, if I’m lucky, caramel apples won’t be too far behind. * Or, I thought it was great until a moment ago when I googled “igloo cake.” Ours did not have penguins frolicking on it. Mom, I think we need to try again.